The Center for International Exchange (CIE) is dedicated to advising and supporting international students. CIE offers a variety of activities and events for international students to form friendships with Japanese students and experience Japanese culture. Our Japanese program includes basic academic Japanese courses to those aiming to develop advanced Japanese proficiency to prepare students for academic work as well as future jobs. We also offer free one-to-one tutoring by graduate students and teachers to assist students in their Japanese studies. English courses are also available for students to develop their practical English skills. Each student belongs to a “Class,” which is an important support unit at Showa Women’s University. Your Class Advisor advises you academically, and provides other personal support to make it easier for you to adjust to life in Japan. 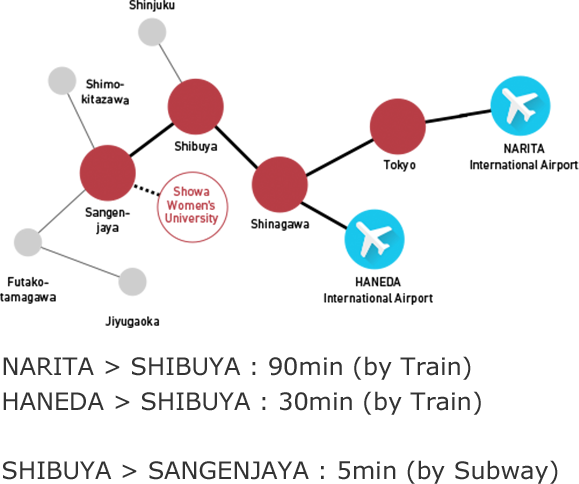 SWU offers 3 types of accommodation choices for international students. A monthly rental fee is approximately JPY 45,000-65,000. All foreign students receive a 30% reduction in tuition. In addition, scholarships are offered to those who satisfy our grade and attendance requirements. Other financial aid includes that by the JASSO (Japan Student Services Organization), and scholarships offered by outside organizations. Showa also offers JET alumni a special work-study program in which they receive scholarships which fully cover tuition, fees, and housing support in return for part-time work at the university. Japanese students act as your host sisters to assist your transition into Japanese college life. We also offer foreign students the opportunity to experience a homestay with Japanese families.